Certified Akaushi Beef provides an eating experience that is above and beyond what any other branded beef product can offer. It’s more than just tender and flavorful. Akaushi cattle provide the best-tasting, and most healthy beef you can eat. One of the main things that sets Akaushi cattle apart from the rest of the beef on the market is the fat content in the meat. While all beef has saturated fats, Akaushi has a higher concentration of monounsaturated fat. Monounsaturated Fatty Acids are a healthy addition to our diets that can actually help people shed fat. The American Heart Association has reported that a diet with a higher amount of monounsaturated fats versus saturated fats can help lower cholesterol. Akaushi beef is also a natural source of oleic acid, the same compound found in olive oil. The USDA has shown in studies that oleic acid is a heart healthy part of our diets. Along with being good for you, oleic acid also gives Akaushi a delicious buttery taste unlike any other beef. All HeartBrand Beef is raised in and sourced from the United States. When you purchase HeartBrand Beef you get the peace of mind of knowing that the product on your dinner plate is source-verified and has been produced entirely in the United States. 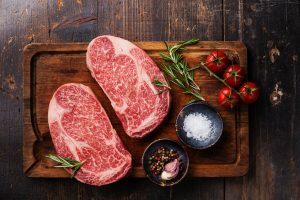 You’re dealing directly with the HeartBrand Ranch and Beeman family when you purchase their beef, which is something few branded beef companies can offer. HeartBrand Beef is raised naturally without hormones. The cattle are grass-fed and then pulled into the Bovina, Texas, feedlot for finishing. Akaushi cattle have extremely good production and produce the world’s most consistent beef all on their own with minimal inputs. Which is something we’re very proud of. 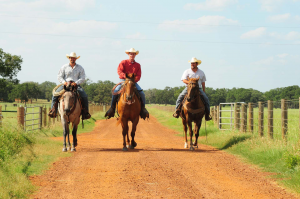 HeartBrand Beef is owned by the Beeman family in Texas. Our president, Jordan, lives with his wife and children on the ranch. Ronald and Jordan Beeman are fourth and fifth generation cattle ranchers and take great pride in the care of their land and animals. The family is involved in every step of the process, from the Akaushi calves being born to the steaks on consumers’ dinner plates.